Sunday 21 Apr - Latest - Amazon (£123.94), Very (£129.99) and JD Williams (£160.00) currently have stock of LOL Surprise Cottage Playhouse. Register for FREE email and Push Notification pre-order and stock alerts. We constantly check for LOL Surprise Cottage Playhouse stock, so you don't have to. 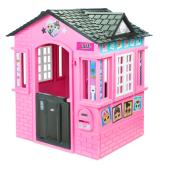 Receive email alerts when LOL Surprise Cottage Playhouse online stock is found.